Sen. Elizabeth Warren’s ex-husband co-founded a DNA testing company and wrote one of the first computer codes for making genetic comparisons. Jim Warren’s career involved him in the kinds of genetic testing that Elizabeth Warren controversially invoked this month to prove that she had Native American ancestry. One of the two other co-founders of his testing company, FamilyTreeDNA, has worked with Carlos Bustamante, the Stanford University geneticist who administered a DNA test at Elizabeth Warren’s request. Why do I think 23 and Me might have gotten different results? Actually I am not sure 1/1024 Indian would even show up on a 23 and Me DNA test. This is a living example of how silly quotas are. Everyone needs to have any application judged on the basis of their qualifications and nothing else. Can we please put all of this group identity behind us and simply identify as Americans? Last time I checked, America was a sovereign country. We are not perfect by any stretch of the imagination but we are what we are. Well, the United Nations wants to make us better. The UK Guardian reported yesterday that the United Nations has stated that the United States should return the stolen land it took from the Indians. Now that could get very messy very quickly. Man, there are a whole lot of connections made in those statements that I am just not seeing. I totally agree with what is being said about the horrible way we have treated the Indians. I just have a real problem with what is seen as the solution. We took land from the Indians and forced them on reservations. Would giving them back land have any impact on the way they live or their prosperity? 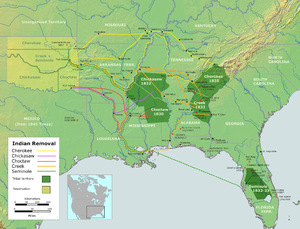 There are specific instances where it might–In 1830, Andrew Jackson, the founder of the Democrat Party, signed the “Indian Removal Act of 1830.” The Cherokee, Chickasaw, Choctaw, Muscogee-Creek, and Seminole Indians (known as the “Five Civilized Tribes”) had prospered, and President Jackson had ordered the Army to relocate them. Gold had been found on their land, and they were relocated. Is the gold still there? Is it accessible? How is the land currently being used? The answers to those questions would make an interesting addition to the discussion. I am not sure anyone has a solution to righting the wrongs done to the American Indian. Giving them their land back really won’t change a whole lot. Giving them an education and helping them transition into the twenty-first century might, but how do you do that without destroying their culture? I will admit to being something of a pro-American snob–I think the American economic system with all its faults is better than any other economic system. I just don’t know how to enable the American Indians to take part in it successfully. I simply am not convinced that giving them back their land is the answer. Just to be difficult, I also think the United Nations has more important things to worry about–people are being killed in Syria by their own government, Christians are being murdered in Nigeria, and there are some serious questions about human rights in China. Aren’t these things a little more pressing than whether or not to return land in America to the Indians?